Is it wrong to tell you, right off the bat, that these enchiladas–any enchiladas, really–are just an excuse to eat that sauce we made yesterday? We loaded them up with good toppings, too–avocado, sour cream, a fried egg…what? You don’t top your enchiladas with a fried egg? It’s high time, I tell you. This dish has all the flavor of good Mexican food without the fussiness of individually-rolled enchiladas. I used the vegetables I had on hand; you should do the same. Except for the potatoes. Do use potatoes. I love potatoes with Mexican flavors. Once you make the sauce you’re most of the way there. Or use a jarred sauce (I like both the Hatch and Trader Joe’s brands), in which case the enchiladas are almost made already right now. Dunk tortillas in the sauce, layer them with well-seasoned cooked veggies and a few handfuls of cheese, and hey presto, you’re done. Fry your eggs just as you take the enchiladas from the oven. There’s no photo of that part because it looked too good. We just had to dig in. Layered Enchiladas with Potatoes, Onions, and Peppers: Prepare your enchilada sauce through the step of simmering it in oil on the stove, or empty a jar of prepared enchilada sauce into a pie plate and set aside. Heat oil in a wide skillet over high heat and add a thinly-sliced onion, a couple of thinly-sliced peppers, and 3-4 potatoes diced into 1/4″ cubes. Season well with salt. Cook, scraping the bottom of the pan often, until the vegetables are softened and browned in spots. Remove from heat. Oil a 9×13 pan (or you can use two smaller pans, as I did, and save one for another day*), then dip 4 corn tortillas in the sauce and use them to line the pan. Spoon half the vegetables on top of the tortillas, then sprinkle with a handful of grated jack or mild cheddar cheese. Continue with another layer of dipped tortillas, another layer of vegetables, a little more cheese and a final layer of dipped tortillas. 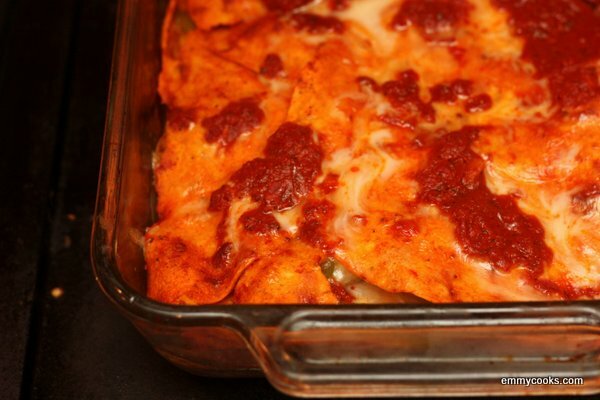 Sprinkle a final handful of cheese on top and dollop any remaining sauce over the top of the enchiladas. Cover the pan with foil (tenting it a little if necessary to avoid contact with the cheese) and bake at 350 until the cheese has melted and the sauce is bubbling around the edges, about 25 minutes. Remove foil and turn on the broiler for a closely-watched minute or two to brown the top. Top each piece with fried egg and serve with avocado slices and sour cream on the side. *Here’s how I freeze enchiladas: I line the pan with a long piece of tin foil and then make the enchiladas in the pan. When I’m done, I fold up the overhanging edges of the foil to enclose the enchiladas. I put the whole pan in the freezer until the enchiladas are frozen solid, then I remove the frozen wrapped enchilada-block from the pan and seal it in a freezer bag for storage. When I’m ready to cook the enchiladas, I take them out of the freezer about 30 minutes in advance so that the edges thaw enough for me to peel off the tin foil, then I plop the unwrapped frozen enchilada-block back into the same pan I used in the first place. I put the pan in the oven before turning it on so that it warms up slowly, and plan for a longer cooking time since I’m cooking the enchiladas from frozen. This entry was posted in Food, Mexican Flavors, Recipes and tagged CSA recipes, DIY enchilada sauce, enchilada recipe, enchiladas, onions, peppers, potatoes, vegetarian on August 28, 2012 by emmycooks. I never thought to put an egg on my enchiladas, which is crazy because they are two of my favorite foods. I’ll never be the same. Um, that’s pretty much making my mouth water. I need to give up rolling corn enchiladas and just layer them like you do. My rolled ones always break and make for a not very attractive dish! Oh, so that’s the trick!?! Nothing wrong with making a whole pan of enchiladas just so you can eat more sauce! This is kind of making me miss the (MUCH less sophisticated) layered enchiladas we used to make in college. 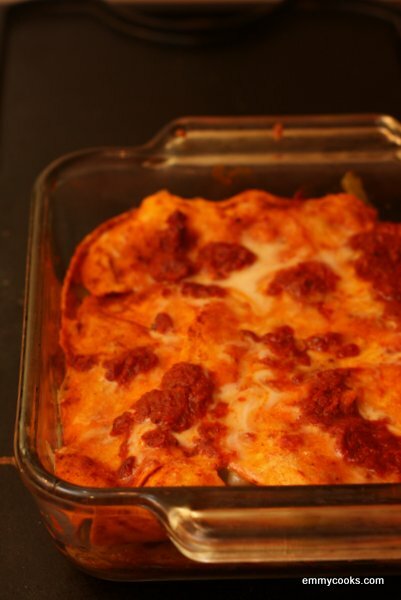 Mmmm – we call it enchilada casserole, and I love to make it with winter squash when the time comes! An egg on top … Now that’s something new! I love enchiladas all year round–when winter squash comes I like them with roasted squash, black beans, and greens, maybe a little feta. Let’s not speak of that yet, though, ok? :) Do try the egg just once, though, and see if it doesn’t convert you. This so SO GOOD. On my list, immediately.